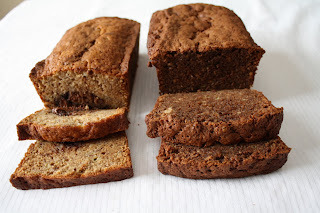 I love banana bread, it is honestly one of my favorite things to eat. And I love it with a big smear of Nutella on it. I know as if it could get any more unhealthy. So I figured why not combine the two but I didn't know how to achieve same creamy goodness as when it is spread on the bread. So I decided to do a trial. My recipe makes two loaves so I figured I would try different things in each. The first I would swirl some Nutella in and the second I would mix the Nutella in the batter. I figured that one of those had to work and lucky for me I would find out quickly since they bake at the same time. As you can see above they look almost identical before they are cut. But once they are cut into they are very different. The Nutella swirl sunk to the bottom, and the one with Nutella mixed in was a nice dark brown. And of course for scientific purposes I had to eat more than one slice of each. 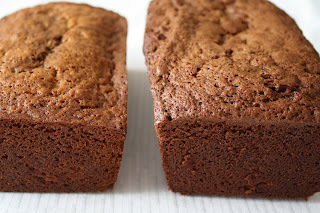 1 cup of Nutella - 1/2 swirled into the 1st loaf and 1/2 mixed into the batter of the 2nd load. Preheat oven to 325 degrees. Butter and flour two 1 lb. loaf pans, or use Pam with Flour. In a large bowl beat eggs until light and frothy. Mix in the oil and sugar. Stir in the bananas and vanilla. Combine the flour, cinnamon, baking soda, baking powder, and salt. Pour the flour mixture into the egg mixture and mix until combined. Divide the batter between the 2 pans. Bake for 55-70 minutes or until a toothpick comes out clean when inserted. They both look good! I love that you tested two recipes. I made banana nutella cupcakes/muffins not too long ago. I love that combo! I'd be happy with either one of those, really. Yum! I think the real scientific conclusion here is to always make two loaves of bread so you can enjoy the best of each!! Speaking of which, I could totally go for a slice of each RIGHT NOW!